I got to go fishing recently. Mike Frisch and I only had a few hours to be on the water, and it was in the middle of a hot summer day: Not always the best time for catching in the summer, but we had the opportunity to be out there and we wanted to take advantage of that opportunity. We were on a lake that had lots of shallow water cover in the form of reeds. We knew that the lake had a good population of largemouth bass, so we started pitching rubber-legged jigs tipped with plastic into the pockets and shadowy areas of those expansive reed beds. Not much was happening: Time for a presentation change. Since the bass didn’t appear to be interested in eating lures that were worked below the surface, we decided to go with a surface bait, but it had to be a snag-resistant surface bait to get through the heavy cover without getting hung up all the time. We tied on frogs, but not the type of frogs that were associated with bass fishing many years ago. These were artificial frogs that don’t mind getting eaten by bass. And, by the time Mike and I were done fishing, a good number of bass had eaten our frogs. They were mostly larger bass, and they were all fun. We saw every strike, and we caught bass in areas where no other bait would have been productive or even fishable. 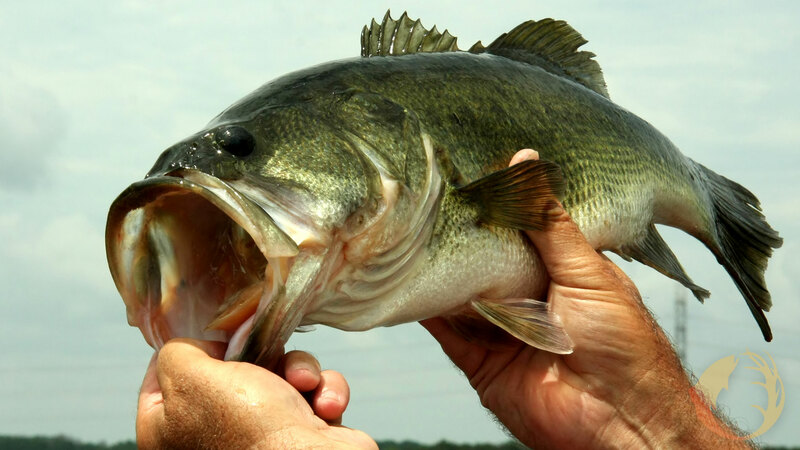 Here’s a quick explanation of how you can catch bass on frogs right now. We tied on Strike King’s KVD frogs. These frogs will go through anything, and the bass really like them. We used white frogs and natural colored frogs, and both caught fish. Sometimes the bass show a color preference. This largemouth bass couldn’t resist a KVD Frog fished through the reeds. As mentioned, we were working large reed beds. We fished quickly and covered a lot of water. We threw along the edges of the reeds and right into the middle. We worked the baits with frequent stops, and most of the strikes came as the bait was sitting still. We didn’t fish the baits all the way back to the boat. As soon as the frog was a couple of feet away from the cover, we quickly reeled in and made another cast. One of the keys is to try not to get too excited and set the hook too quickly when a fish hits. Often times you can see the water hump up several feet from the bait as the bass approaches, and, if you’re watching, you’ll always see the strike. It’s easy to jerk right away, but you need to drop the rod tip and let the fish get the bait in its mouth. Easy to say, harder to do. This is heavy cover fishing, so you need equipment designed for heavy cover. 65 pound test P-Line XTCB Braid doesn’t stretch and provides for long casts, making it a great line for frogs. You also want a heavy rod with just a bit of give in the tip. There are rods make specifically for froggin’, but I was using a Lew’s Flippin’ rod that did an outstanding job, and it also serves well for pitching jigs and even throwing spinnerbaits. Lew’s makes technique specific rods, but they also create outstanding rods for several techniques, and I like that. It simplifies my fishing a lot. If you would like to get in on an exciting and productive way of fishing, you owe it to yourself to go froggin’ for largemouth bass. Now is the time to do-so.